Sr. Monica, Sr. Christoper and Sr. Agnes celebrate their Jubilees. Absent from the photo is Sr. Gertrude. Amidst the flurry of activities and the full schedule planned for the annual Community Days at Mount St. Macrina, there is always time to celebrate. This summer four Sisters joyfully marked significant milestones in their lives as Sisters of St. Basil. As the second oldest member of the community, Sr. Gertrude Martin celebrated the Diamond Anniversary of her religious life. Since Sr. Gertrude resides at the Manor, the Sisters joined her in a celebration on the Monday afternoon of Community Days. After singing two odes of the Akathist to Our Lady of Perpetual Help, a social was held in the Manor’s Oaks Dining Room where Sr. Gertrude received the congratulations, gifts and well-wishes of the Sisters. Tuesday afternoon found the Sisters gathered in the Chapel for a Divine Liturgy of Thanksgiving offered by the Monastery Chaplain Rev. Peter Leigh for all the Jubilarians. 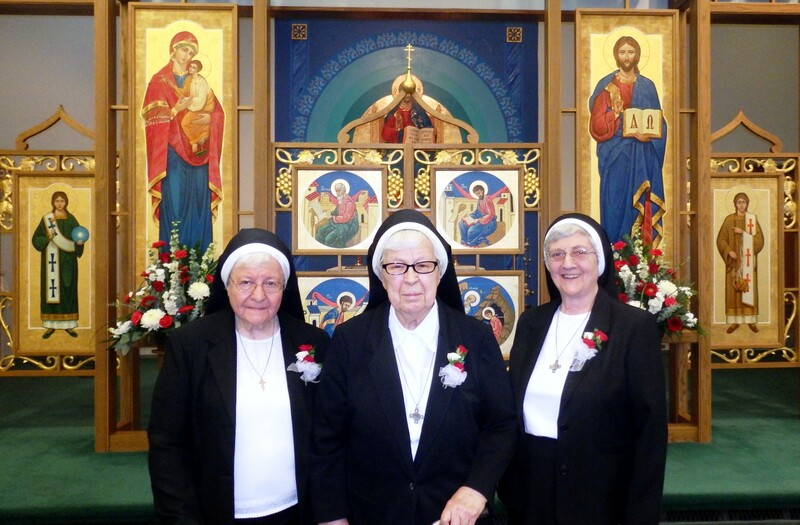 Besides Sr. Gertrude, Sr. Christopher Malcovsky observed her 70th Anniversary, and Sr. Monica Husovich and Sr. Agnes Herbenick observed their 60th Anniversary. From the beginning processional to the final singing of “God grant you many years” the Divine Liturgy was an inspiration as all raised their voices in thanksgiving for the gift of each Sister Jubilarians’ vocation. Brief biographies of the Jubilarians follow. Sr. Gertrude entered the Community from St. John the Cathedral Parish, Munhall, Pa. She spent 33 years molding young minds and morals as a teacher mostly in the primary grades in parish schools in New Jersey, Pennsylvania, Illinois, and Indiana. Her education apostolate included 12 years as principal. Sister holds a B.S. in Elementary Education from Misericordia College, Dallas, Pa.
From 1975 through 1980, while continuing to teach, Sister was a member of the Provincial Council. During the latter half of this term, she moved from teaching to serve as assistant house director at the monastery. Sr. Gertrude was then assigned as administrator of St. Basil’s Home from 1980 through 1986. A brief return to teaching took her to St. Mary Assumption Church, Trenton, N.J., where she spent three years. Sr. Gertrude was a familiar face as the manager of the Religious Gift Shop at Mount St. Macrina for a good number of years. Presently, she resides at Mount Macrina Manor. Sister Christopher Malcovsky entered the community from St. Mary’s, Nesquehoning, Pa. Her beginning years were spent as a teacher and principal. She then served as Motherhouse Superior and then she was elected as Provincial Superior for two terms. After a sabbatical year, Sr. Christopher served in various capacities, assisting with the organizational work in Eparchy of Van Nuys, and helping at Mt. Macrina Manor and the House of Prayer. In 1983, Sister was elected as General Superior, serving in Rome for six years. From 1991 until 2008, Sister Christopher served in the Eparchy of Van Nuys as Pastoral Associate, first at the Cathedral of St. Mary’s in Van Nuys, Calif., and then at St. Stephen’s Pro-Cathedral, Phoenix, Arizona. Additionally, she also managed the apartment complex at St. Stephen’s. Presently, Sr. Christopher resides at the Monastery; she assists part-time in the Religious Gift Shop and, otherwise, generously offers her services wherever needed. Sister Monica Husovich entered the Sisters of St. Basil from St. Mary’s in Freeland, Pa. She served as both teacher and principal in parish school principally in Pennsylvania, but also in Indiana and Ohio. Sr. Monica also taught at Byzantine Catholic High School in Parma, Ohio. While teaching in northeastern Pennsylvania, she served as a member of the Catechetical Board for the Eparchy of Passaic. Sr. Monica then served on the staff of Mt. Macrina Manor, first in the business office, and later as Admissions and Resident Coordinator. Following her retirement from the Manor, Sr. Monica kept busy taking the Monastery Sisters for their appointments as needed; she also faithfully takes care of posting the prayer requests sent to the community. Sister Agnes Herbenick came to the community from St. John’s in Lyndora, Pa. Her principal ministry has been in the educational field, serving as a teacher in parish schools in Pennsylvania, Connecticut, New Jersey and Ohio. For 25 years, she guided eighth graders at St. Mary’s School in Cleveland, Ohio. Among Sr. Agnes’ other assignments were in catechetical ministry in Binghamton, N.Y.; postulant directress for the community, and a member of the Mt. Macrina Manor Board of Directors. After retiring from the teaching ministry, Sr. Agnes returned to the Monastery, where today, she serves as sacristan. In addition, she works part-time in pastoral ministry at Mt. Macrina Manor. As one can see from reading just these capsule pieces of information, each of the Jubilarians has actively served the Church in a variety of ways, each Sister giving witness to the priority God has in her life. Not able to be enumerated or even noted are, surely, the countless lives which have been touched by personal contact with these Sister Jubilarians. For all of these Sisters, and for the giftedness with which the community has been enriched and blessed, it was with heartfelt gratitude, that “God grant them many years” was sung as we joined together for a celebratory meal following the Divine Liturgy.